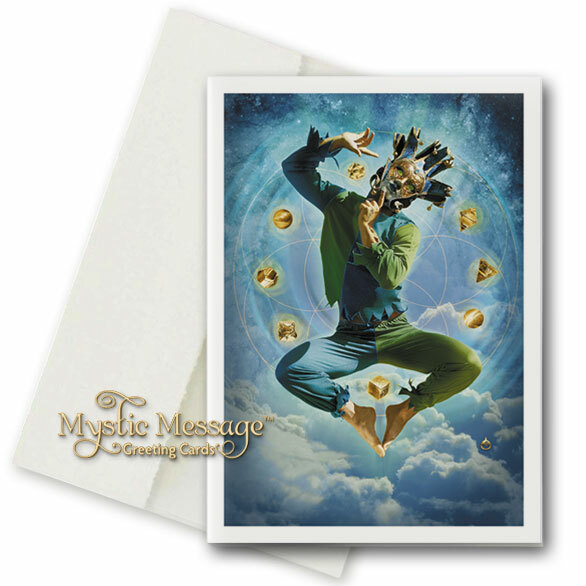 The Trickster leaps above the clouds, juggling the Platonic solid shapes: the dodecahedron, octahedron, hexahedron, tetrahedron, and icosahedron, plus the sphere that represents the totality of experience. The Platonic solids were believed to be the fundamental building blocks of all matter in the Universe. These objects remind us that we, too, can go back to the basics. Behind the Jester is the Seed of Life, the source of all things and the emblem of renewal. When things go “wrong” in life, the Trickster reminds us not to give up, but instead to see what is comical in our humanness. Don’t be discouraged! We can re-frame our mistakes as “experiments” in Life’s laboratory, and take them with lightness and laughter!